Learn how to manage permissions. All users have the permissions of any group they belong to. All users also have any permissions that are assigned explicitly. That is, a user has the union of group and explicit permissions. Even if the user is removed from a group, that user keeps any explicit permissions. Users with Users & Groups permission can set the default user group and can assign permissions or revoke permissions at the group level or for individual users. 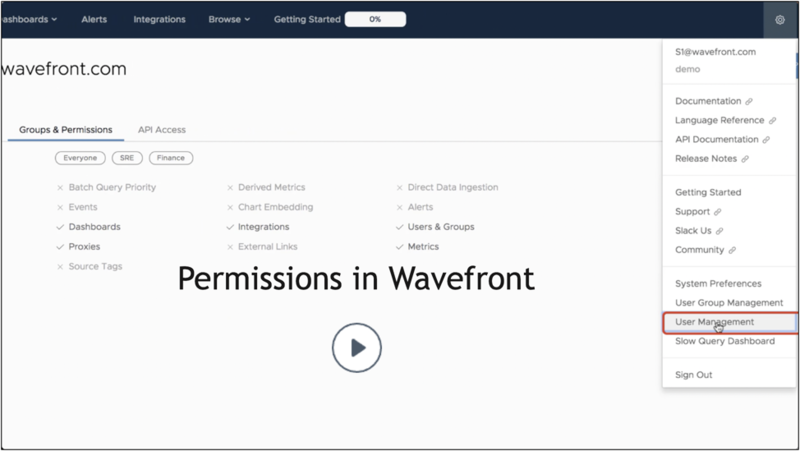 Note: You must have Users & Groups permission to view and manage users and permissions in Wavefront. Otherwise, the relevant UI elements aren’t available to you. Permissions determine which tasks a Wavefront user can perform. All new users can perform all new user tasks such as viewing dashboards and charts. In addition, administrators can grant and revoke permissions for users and for groups. This video shows how you find out the permissions you have, and how to manage permissions for users and groups. Note: If a dashboard or alert is protected by access control, new users can see it only after it’s been shared explicitly unless they belong to a group that has access. Administrators can view and modify new user default permissions and new user default groups from the gear icon (System Preferences > New User Defaults). Because all new users are assigned to the Everyone group, permissions change for all existing users and all new users if you change those permissions. Create a group and assign the permissions you want for each new user. From the gear icon, select System Preferences. Select the New User Defaults tab and type the user group name in the Default User Groups field. Click the gear icon and select User Group Management. Click the group you want to change. Select or deselect checkboxes for the permissions you want to change and click Save. Click the gear icon and select User Management. Click the user you want to change. Select or deselect checkboxes for the permissions you want to change and click Update. Note: If a user has a permission because of group membership, the check box for that permission is disabled for edit. Remove the user from the group that granted that permission to revoke the permission.